"One of the first buildings to come out of the ground in Manhattan is likely to be a boutique office building at 505 Fifth Avenue, at the northeast corner of Fifth and 42nd street, said Mary Ann Tighe, vice chairman of Insignia/ESG, the brokerage and services company. "That site can be cleared fast — there's nobody in those buildings," she said of the site, partly occupied by a one-story former bazaar-like shopping complex. The building would be of modest size by New York standards, with 275,000 square feet in a slender building rising 25 or 26 stories. Kurt Eichler, executive vice president of the developer, LCOR, which is based in suburban Philadelphia, said he expected to sign a principal tenant before commencing construction. " The LCOR project was much better. It's a shame that -- for the most part-- great architecture is a thing of the past. Developers now build cheap boxes that maximize their profits. My buddy used to work in one of those buildings, slated for demo. That was 3 years ago...his firm was evicted, then. It's amazing to me how long it takes to close deals. Those bulidings were vacant, this whole time. Well, if it looks like the rendering and the skin is illuminated nicely, it might be nice. True, and a great improvement over what was there. It's still not as nice as the LCOR proposal though. Yeah...I agree. I like this building as well...I don't see anything wrong with it at all. Oh well. That's the design I was rooting for. An insipid filler instead of a potential local landmark. I like both of them but whichever they build it will look good. Bryant park area is really gonna take off soon with new stuff. I agree. 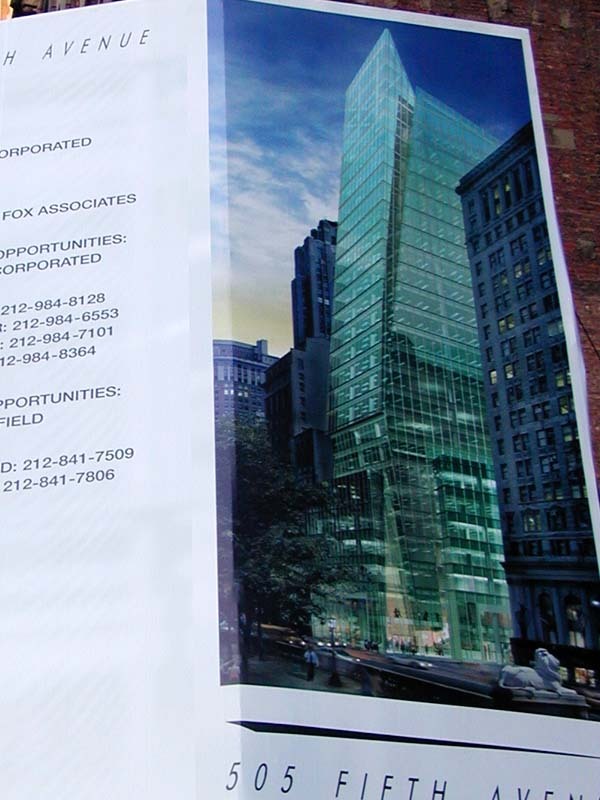 The rejected design plays off of 500 Fifth very well. March 31, 2004 -- WEARING work boots and jeans, Dr. Axel Stawski celebrated the first pouring of concrete at 505 Fifth Ave. last Friday by tossing in a handful of change, including Roman coins and a Sacagawea dollar. Paul Katz of Kohn Pederson Fox designed the concrete and glass 26-story tower in an inspiration from the sparse, International-style favored by the German-born developer who heads the Kipp/Stawski Group. The approximately 300,000 square-foot office building now rising on the northeast corner of 42nd Street includes an open book-like protrusion on the Fifth Avenue side so that future corporate honchos can watch the ongoing parade of pedestrians up and down the avenue. A team led by Paul Glickman of Cushman &amp; Wakefield has been hired as the agents for the office floors that should be ready for possession in late 2005. The 20,000 square feet of retail space will be handled by Robert K. Futterman &amp; Associates. "There are many unique architectural details that are highly attractive to financial firms and boutique office tenants," said Glickman. These tenants tend to now rent in the Plaza District. "Until now, they have not had this kind of product available to them in the Grand Central District." There are many unseen structural safety features along with various setbacks, terraces and a clear glass canopy leading to an atrium lobby on the East 42nd Street side of the corner building. 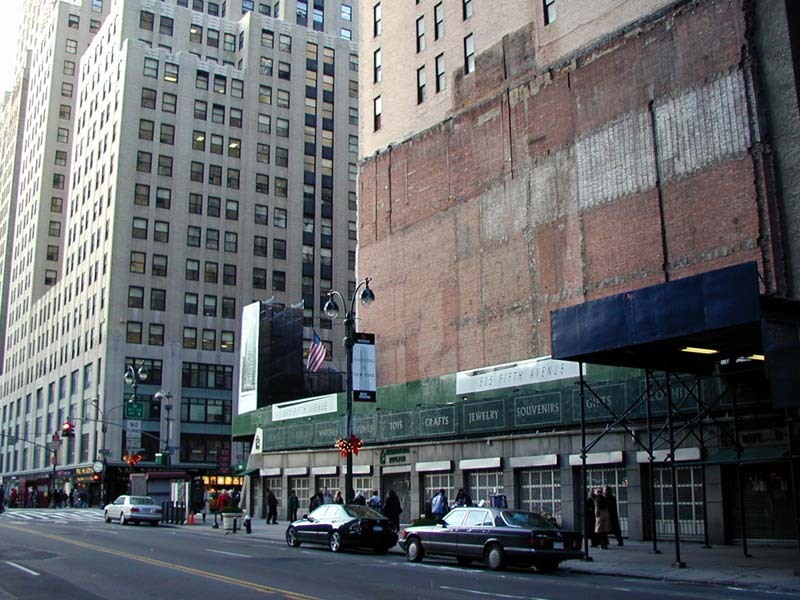 A cut-out on the 43rd Street corner can also become a private entrance for either an office or retail tenant. Stawski told us he is in discussions with minimalist artist James Turrell to light the lobby, perhaps the canopy, and the lightbox on the structure's skyline. For the last 15 years the corner has been an eyesore as it slipped through several owners with grand plans but no financing. 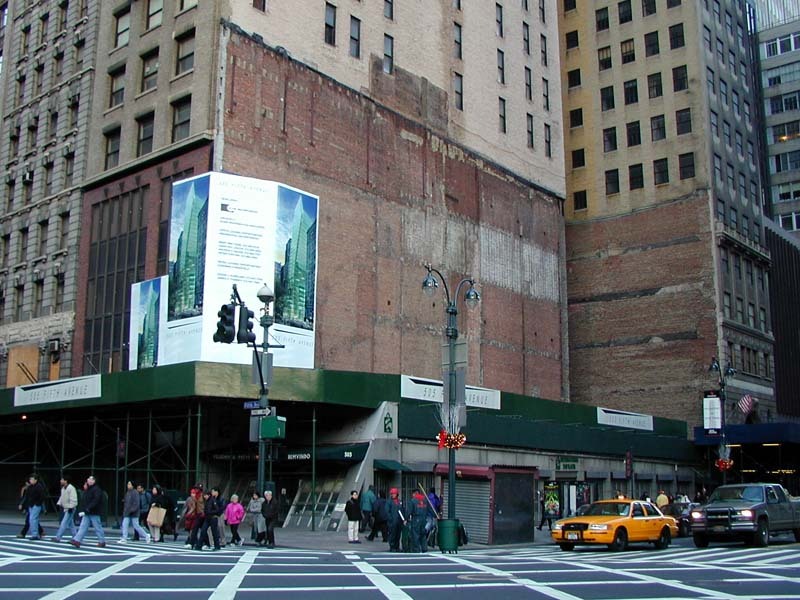 The Greek-owned 1 E. 42nd St. was long a target for more square footage. That building was finally sold and Stawski garnered 10,000 square feet of its air rights to create the 26th sun-drenched floor on his new project. The angle of the west face is interesting but it will minimize the views from inside the building of Bryant Park and the Library (or the space above the Library). I would have thought that in such a tight space as Midtown you would want to maximize those views. Instead it kind of forces you to look north-west.